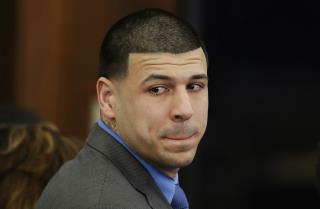 (Newser) – Though a prison official initially said Aaron Hernandez left no suicide note, three notes were in fact found in his cell at Massachusetts' Souza-Baranowski Correctional Center, reports the Boston Globe. A statement from Worcester District Attorney Joseph D. Early Jr. confirmed the handwritten notes were found next to a Bible in the cell following his death, ruled a suicide by the state medical examiner on Thursday. But a rep for Early wouldn't say to whom they had been written. Sources tell TMZ that one was addressed to the general public. However, sources tell CBS Boston that there was a note each for Hernandez's mother, fiancee, and 4-year-old daughter, reading, "I love you and please don't cry." Why the number of suicide notes considered Newsworthy is beyond me... Seems like the one family-oriented detail that should be left out. Buncha Tabloid junkies in this country.